Honeywell has announced the Sucre Box and Sucre Box+ security panels, which offer integration with other systems through the Honeywell Total Connect Comfort International (TCCI) mobile app, including Honeywell evohome thermostats. The new security panels follow on the launch of Honeywell Cloud Services and the first Le Sucre wireless intruder alarm panel for self-monitoring service. Le Sucre with Honeywell Cloud Services offers a self-monitoring and remote service solution, which can be placed anywhere in the home. When an alarm is triggered, whether by a motion detector, smoke detector, or carbon monoxide alarm, the homeowner is alerted by email or text message – providing peace of mind that their home is secure, wherever they are in the world. Developed to interface seamlessly with the Honeywell Cloud and Le Sucre, the new Sucre Box panel is connected directly to the internet router through an IP Ethernet connection. 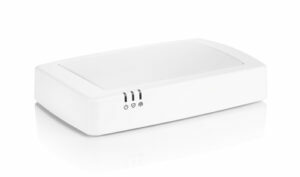 For situations where internet connectivity is less reliable, or there is a risk of power loss, the Sucre Box+ model includes an integrated SIM card module that enables a secure GPRS link using mobile phone networks. The launch of Sucre Box is accompanied by new compatibility with the Total Connect Comfort International mobile app. The app allows homeowners to control their Sucre Box security system remotely, arm or disarm the system, and verify an alert received through Honeywell Cloud Services. For example, if a motion detector with built-in camera is triggered, the Sucre Box ensures that images are recorded, transferred, and stored securely on the Honeywell Cloud. Homeowners can then access their images on smartphone or tablet via the mobile app, wherever they are, and verify if the alert was triggered by mistake. The homeowner can also request further live images if needed, for additional peace of mind.